If you follow me on Instagram you’ll know I love a bit of arts and crafts, in particular upcycling. 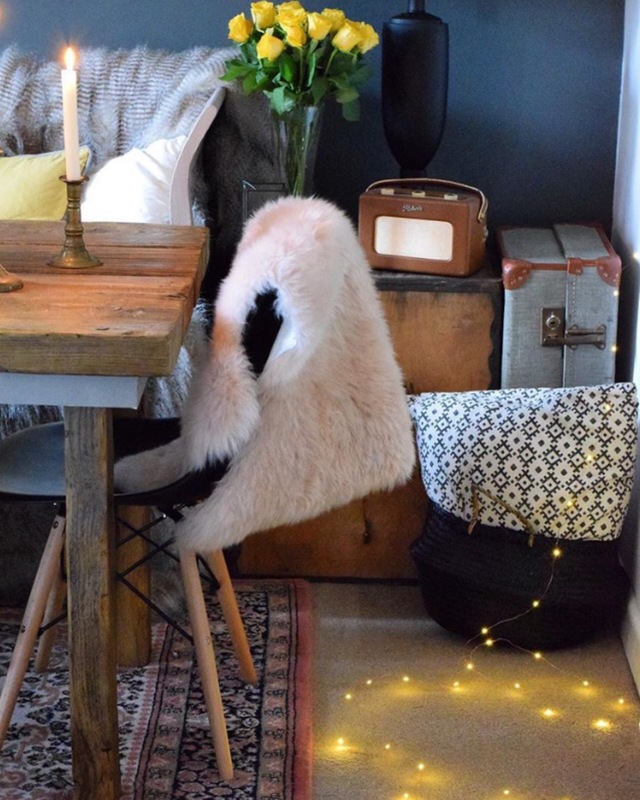 If you have been living in a cave and have no idea what I’m talking about then you should probably know that upcycling is extremely popular these days and it basically means taking an existing item and turning it in to something else. Whether that means keeping the item in tact and just using it for another purpose or turning it in to something else. I do a lot of upcycling for a number of reasons. I enjoy being creative and love taking on projects. 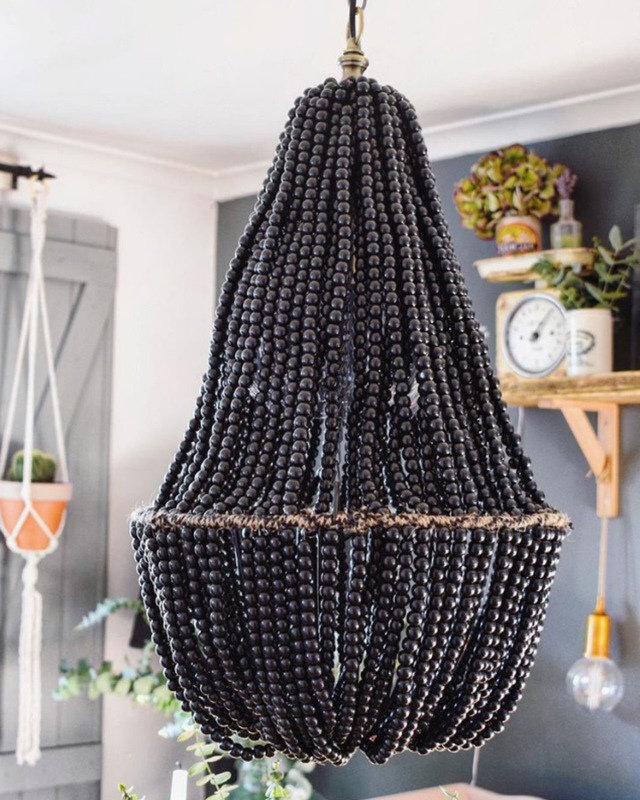 It makes my home look unique and I love that something old can become something new. 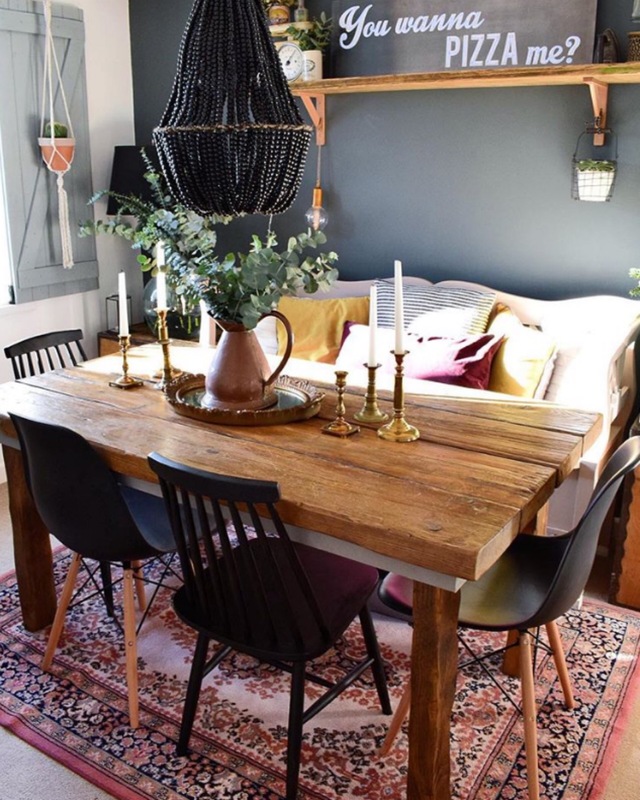 Luckily my husband is a scaffolder so scaffold boards (yes boards, not planks) are easy for me to come by, but if you don’t know any scaffolders then eBay or gumtree are a great place to start. 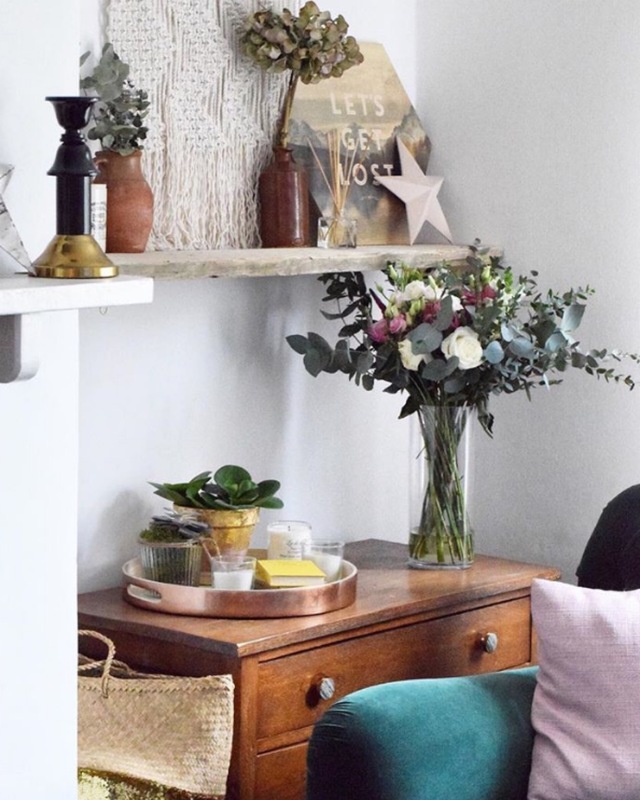 Scaffold boards make excellent shelves, and can create anything from a rough rustic look, to a polished, stained look. You could even sand and paint them. 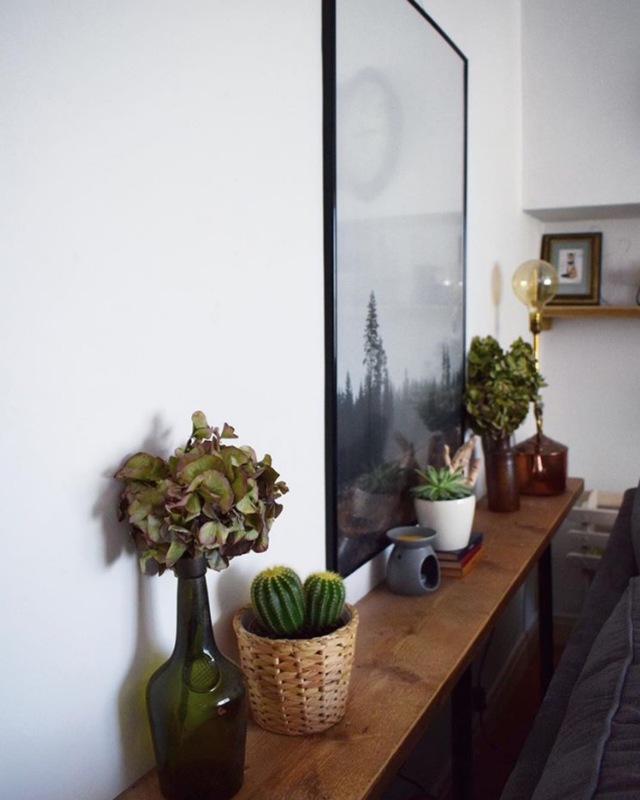 I also made a shelf from a plank of wood from home base, drilled a hole in each corner, threaded rope through and knotted it and then attached to a picture rail above our bed using picture rail hooks. I won’t lie, the first night I thought it might be ‘death by terracotta pot’ but it’s been up for a couple of months and hasn’t killed us yet! In our downstairs loo, that I never photograph because it’s just plain boring, I turned a Mason jar in to a light. It was easy to make and ridiculously cheap. 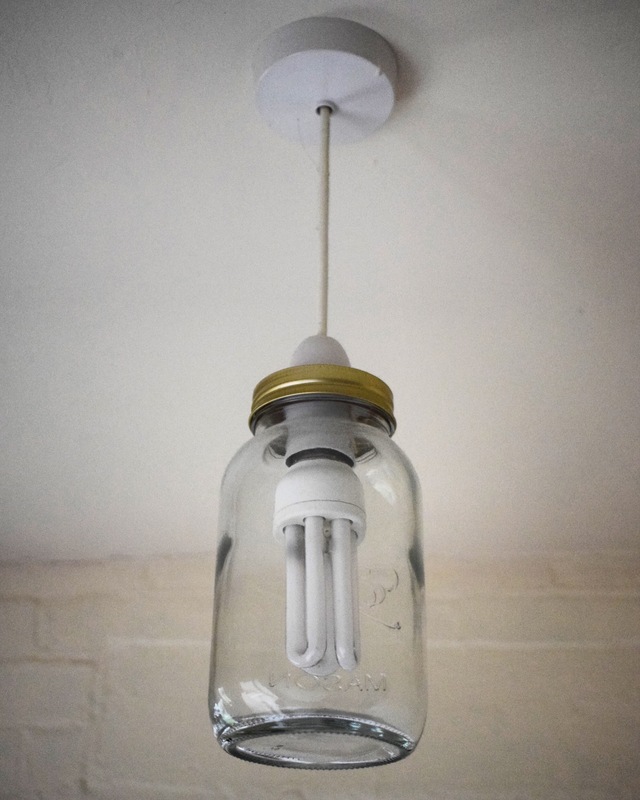 I got a Mason jar for about £1 from homebargains, made a hole in the top for the light fitting, along with a few little holes to let the heat out, and attached it. Easy! 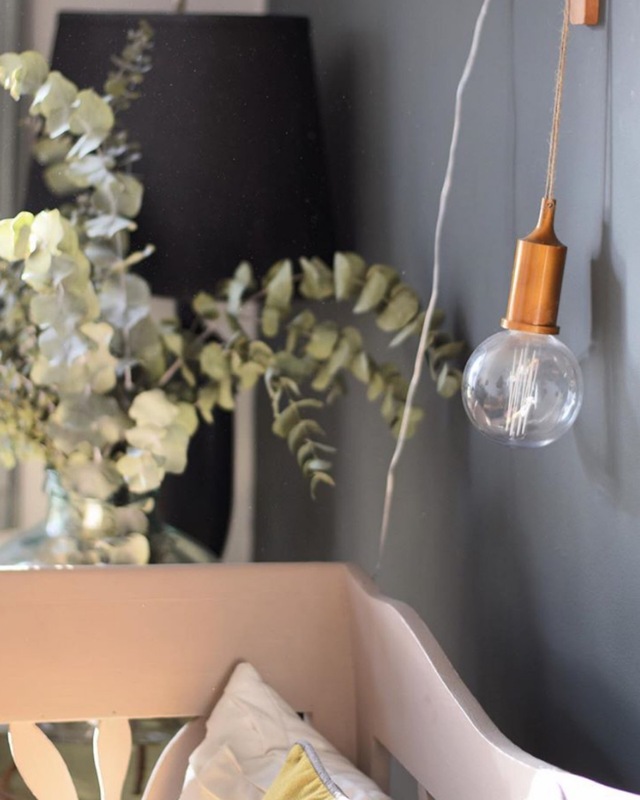 I also got a filament bulb on a string from The Range for £3.99, I didn’t like the string so I replaced it with twine and sprayed the cheap looking white plastic with copper spray paint. 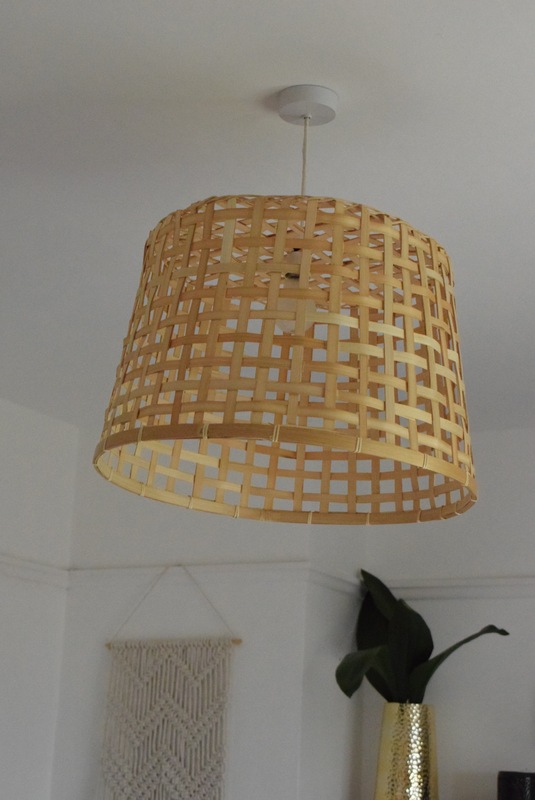 In our bedroom I converted a bamboo basket from ikea in to a light shade by turning it upside down, making a hole in the bamboo and attaching to the light fitting. 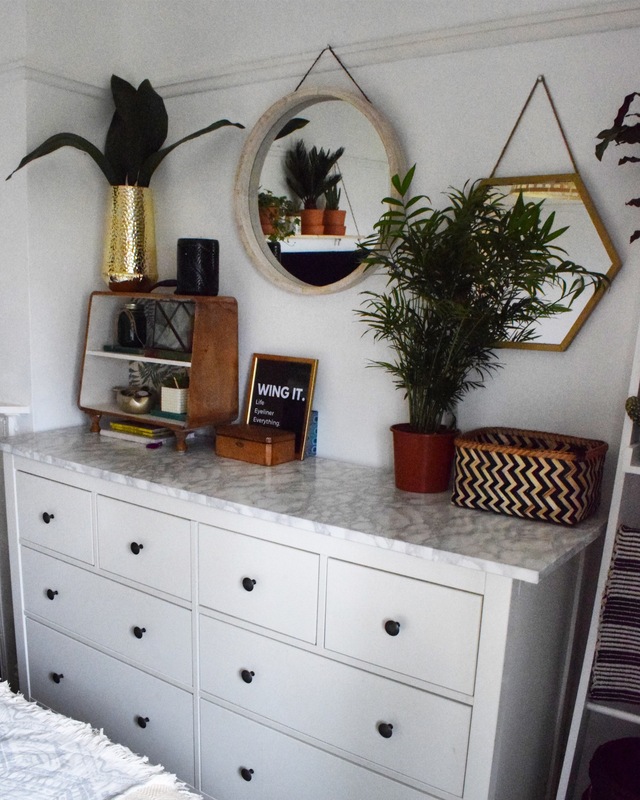 Ikea furniture is so easy to upcycle, it can be as simple as changing the knobs on a chest or drawers, or giving it a lick of paint. In our bedroom we have a large chest of hemnes drawers. 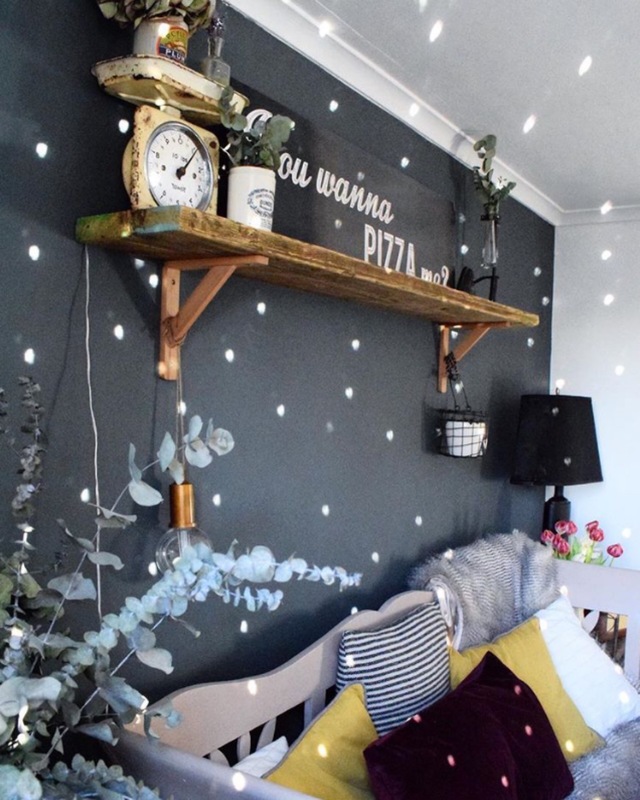 I wanted to give them a bit of a makeover so I bought some marble self adhesive from Homebase and covered the top. I have to say it was reasonably easy and extremely effective. In our living room we have a singer sewing machine table underneath our TV. It doesn’t serve much purpose but it looks nice. I was looking for some side tables to go either side of the bench in the dining room when I came across some vintage tea chests on gumtree. They were only £5 each, so I gave them a clean, stained them, turned them upside down and whacked some lamps on them! Painting vintage furniture is probably the most popular way to upcycle something, which I have done a fair bit of. 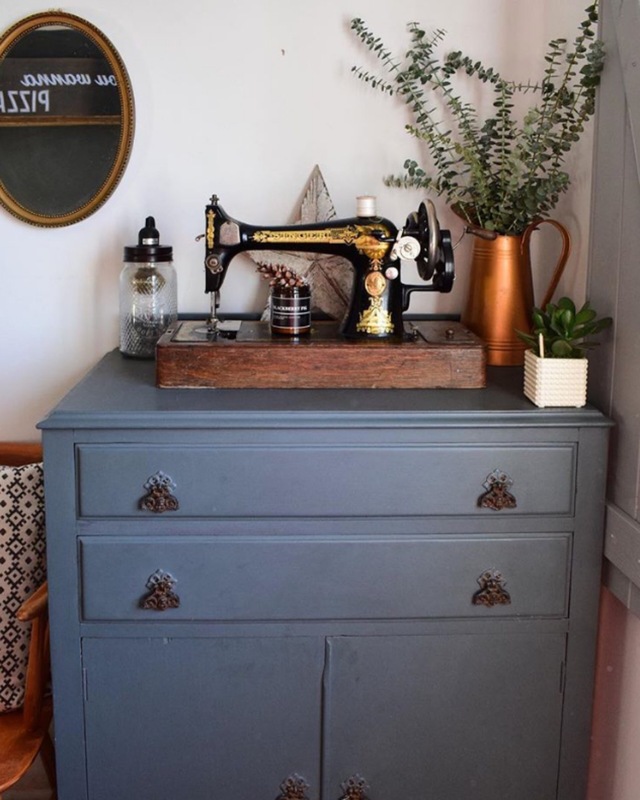 Annie Sloan chalk paints are great for upcycling, and if you want to put a bit more graft in then farrow and ball works amazingly too! Because we live in a rented property there are some limits to what we are allowed to do. Therefore upcycling things temporarily is something I am always exploring. 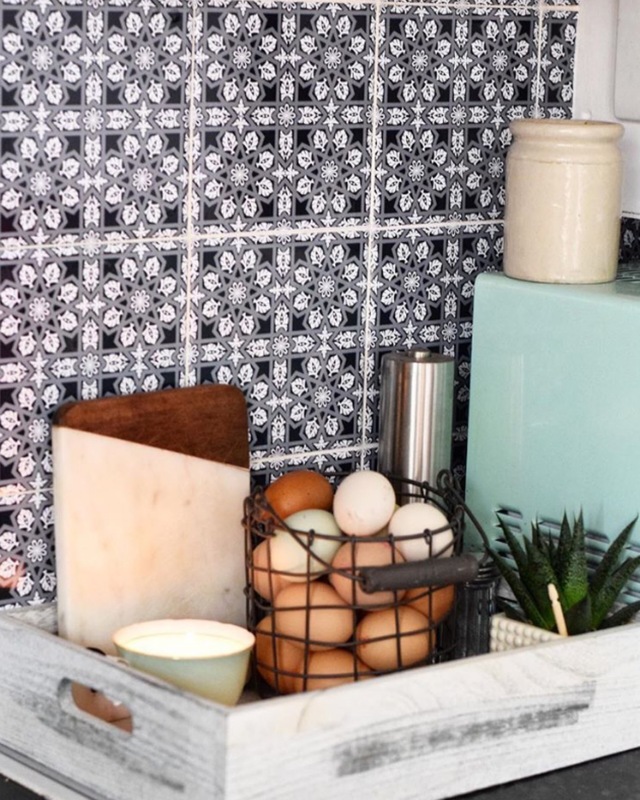 You may have seen my kitchen tiles that I recently have a makeover to using tiles stickers. I was apprehensive at first but once I got going I couldn’t believe the transformation. They have made the kitchen look completely different! 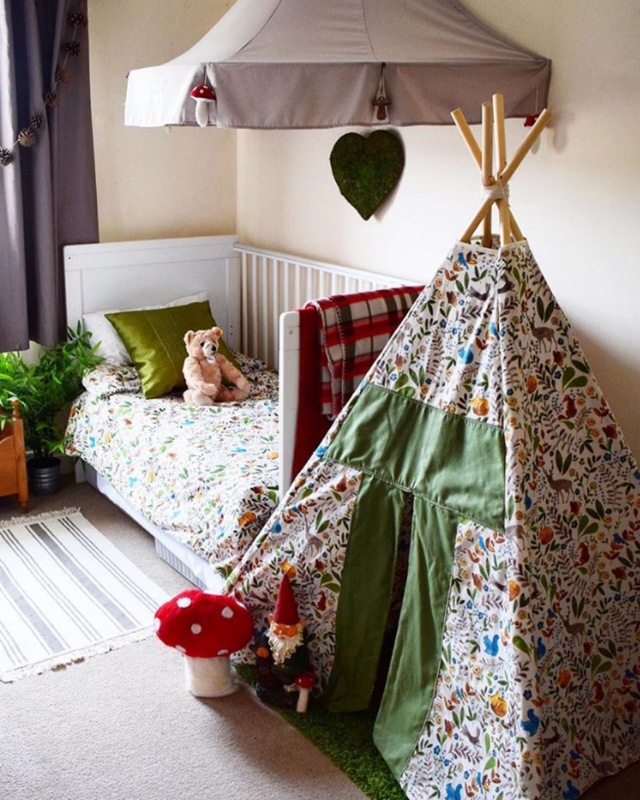 In my son’s room my mum transformed a duvet cover in to a tepee. Always try to see the possibilities with fabric, it doesn’t have to be on a roll to make things with it. 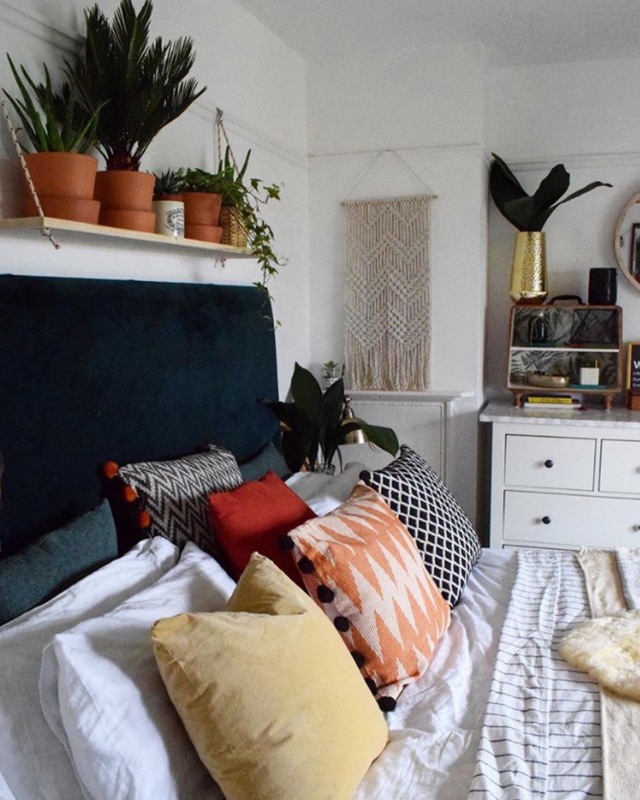 Before I decorated our bedroom I had a runner on the bed that I have made from some vintage curtains. The possibilities are endless! 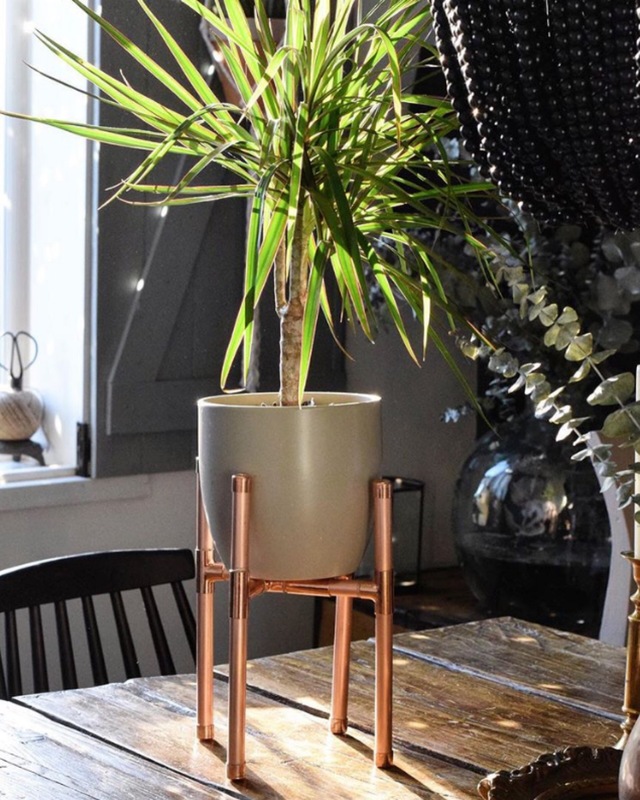 Most recently I made this plant stand out of copper pipe! I got the tutorial from Pinterest and it was really easy! 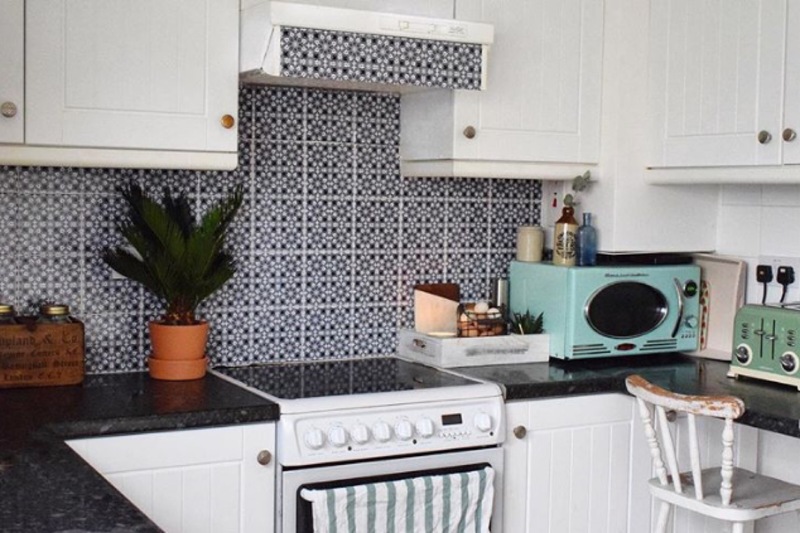 I’ve got loads more upcycling planned as I’m giving our kitchen and utility room a makeover at the moment so keep your eyes peeled! I hope I have inspired you to get creative and think outside of the box! 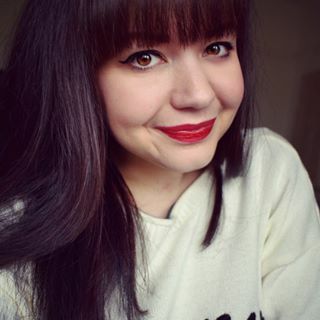 Next Post Not ready for summer?